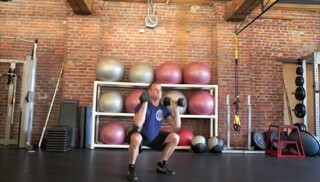 The dumbbell thruster is a challenging multi-joint exercise that targets the legs, shoulders and arms. 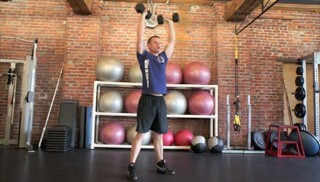 Stand with your feet shoulder width apart while holding the dumbbells on your shoulders. Squat down making sure your hips go below your knees and your back is flat. Stand up through your heels and press the dumbbells up at the top of the squat. 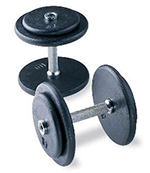 Use your legs to drive the dumbbells up and fully extend your arms at the top of the press.